No no no. After much searching this is it, under the roadside bench just in from the Combi unit. The valve is shown in the "drain" position. I hope this helps other Base Camp owners with winterization. Thanks Donn. I'll be taking a swing at this tonight! Have fun and let me know how it works out. I'm new to this and decided not to blow out the system with air and did not fill the pipes with antifreeze. I did dump antifreeze into the traps and drained the water pump. However, I live near Seattle and we don't get the hard freezes you probably would get. I grew up in WI so I understand freezing pipes and would probably winterize my BC differently if I lived there. There is another thread where I run through what I did. 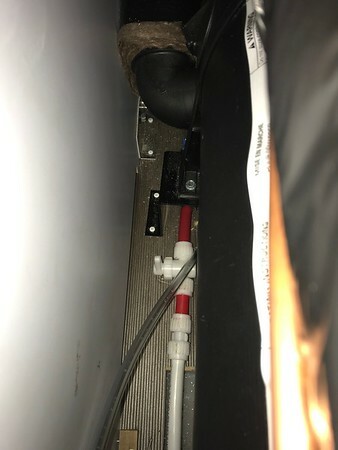 I noticed in your pic AS used a different style connector for the pex piping. Interesting. I have odiker style clamps. Looks like you have compression connections. Is yours one of the early or later units? Hmm, I bought it just a few months ago and it's listed as a 2017. So, newer? No I don't think so. I think you are looking at a shut off valve. 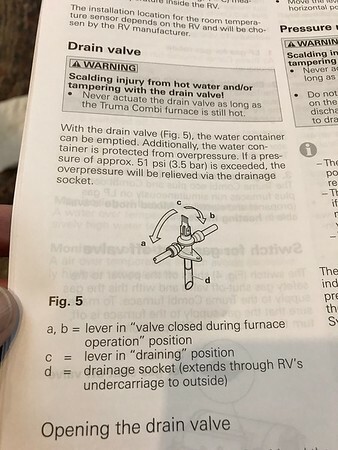 It is a drain valve, I must have a different style then. I turned it and water ran out through a tube straight down to the outside.